Bicycle enthusiasts can enjoy this approximately 50 mile bicycle tour of Pike County, Ohio. The ride starts in the middle of Waverly at Canal Park and heads out into the country for a pleasurable ride along the Scioto River Valley. The course comes back into the North side of Waverly and crosses U.S. route 23 to head out into a beautiful creek valley that gradually rises into the hills. The terrain difficulty is rated at 3 and is an ideal training ride to prepare for the Tour of the Ohio Scioto River Valley (T.O.S.R.V.). This tour is similar to the annual Dogwood Festival Bicycle tour that is held each year during the last full weekend of April. Recently named one of the top 100 "Must Play Courses of Ohio" by Golf Styles Ohio Magazine, Big Beaver Creek Golf Club features bent grass tees, greens, fairways, and offers four sets of tees from which to choose. Over 7000 yards of greenery lie in front of golfers challenging their skills from the back tees. Golfers can also look forward to taking on the course's historic signature 14th hole. Call ahead for information or to reserve tee times. Located 23 miles north of Portsmouth, 22 miles south of Chillicothe, 60 miles south of Columbus, follow signs east of Piketon on St.32 or signs on US Rt. 23 in Piketon. Originally part of Shawnee State Forest, this forest was established in 1928 with the acquisition of 285 acres. Today, it covers 12,749 acres in Pike, Scioto, and Adams Counties with 12 miles of bridle trails and 3 miles of hiking trails. It is open to visitors between the hours of 6 a.m. - 11 p.m. daily, though legal campers, hunters, and anglers may be present during other hours. For nearly 1444 miles, the Buckeye Trail winds around Ohio, reaching into every corner of the state, including Pike County. From a beachhead on Lake Erie near Cleveland, to an hilltop overlooking the Ohio River in Cincinnati, a hiker can experience a little of all that Ohio has to offer. A place of rare natural beauty in Ohio's Appalachian region, owned and operated by the Ohio-West Virginia Youth Leadership Association. Camping is available to long-term only camping from April 1 through the end of October. Camping and other information is available at the YLA website. Dogwood Hills is an 18 hole golf course located 10 minutes north of Waverly, Ohio, just off Rt 23 at 1193 Debord Road, Chillicothe Ohio. The facility features a full driving range, practice putting and chipping green, an open air pavilion and a snack bar. This scenic course is situated on 130 acres of rolling terrain that challenges the golfer of every level. From tree-lined fairways to significant elevation changes the golfer will find a nice combination of beauty and difficulty. For tee time, special events, and annual membership fees call (740) 663-2700. 2000 acres in the beautiful hills of southeastern Ohio. Here we breed and raise some of the finest sporthorses to be found anywhere in the world!!! We also breed and offer for sale American Mastiffs, the Gentle Giants! Major imrovements are now taking place at the lake to address structural deficiencies and bring the dam into compliance with safety standards. The improvements are expected to be completed for the Spring-Summer 2017 boating season. Please note that during construction, the parking lot and lake access are closed. Lake White offers unlimited horsepower boating, swimming, fishing, and picnicking. Recreation for people of all ages awaits at this family getaway! Favorite attractions include a 350-foot waterslide, a 238-foot tube slide, a 20-acre lake with a sandy beach for swimming...and that's just the beginning. There's also a giant mushroom water shower, canoes, paddle boats, miniature golf, adult and kiddie go-karts, basketball, tennis, sand volleyball, a softball diamond, an indoor recreation room with pool table and video arcade games, a moonbounce, a camp store, and a concession snack bar. Plus there's a laundromat, new restroom facilities, and picnic areas with shelter houses to go along with the many cabins and camping facilities on site. McGolf Practice Facility is the "premier golf range" and the "longest range" in southern Ohio, featuring outdoor and covered (heated) bays, yardage markers and landing nets, and fiberbuilt mats. Other services offered include club and golf equipment repairs, professional fittings, lie and gapping sessions, and more by the 2006 and 2007 Clubmaker of the Year. McGolf has been selected as a Top 100 Best Club-Fitter by Golf Digest each year since 2011. Open Monday through Thursday from 10 a.m. to 6 p.m., Friday from 10 a.m. to 5 p.m. and Saturday from 10 a.m. to 6 p.m. Numerous youth leagues, six-lane heated pool, gymnasium, fitness center, outdoor playground area, soccer fields, aerobics/dance studio, handball/raquetball court, tennis courts, outdoor basketball courts, and more. Covering 11,961 acres in Pike and Highland Counties, this forest is home to Pike Lake State Park, It provides 33 miles of bridle trails and 15 miles of all-purpose vehicle trails for those who want to get into the heart of the forest. 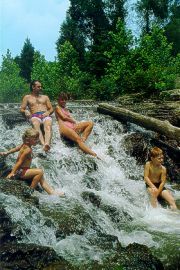 Pike Lake State Park offers, camping, cottages, fishing and hunting, swimming, boating, picnicking, and hiking. Reaching into Pike County from neighboring Ross County, this forest covers nearly 9,400 acres and offers some of the most breathtaking scenery imaginable during the fall and winter. For the outdoor adventurer, the forest offers 26 miles of combined bridle and mountain bike trails, as well as a one-mile hiking trail. The forest is also home to Scioto Trail State Park. Located in scenic Southern Ohio, we have over 15,000 acres of prime hunting land throughout Pike, Adams, Highland, Scioto and Ross Counties. With several areas planted with food plots, we attract some of the largest trophies in the country. We offer guided hunts for trophy deer. A camping facility for horseback riding. Our guided trail rides provide a chance for riders to get out into the wilderness areas to view the rolling hills of Southern Ohio, former lands of the Erie and Shawnee Indians. Horse rental and guide by appointment only. In the far northeastern part of Pike County, 6 miles from S.R.35 between Chillicothe and Jackson, Ohio. Owned and operated by Deputy Roy McNutt, 1999 President of the Buckeye State Mounted Deputies. Canoe and Kayak rental, shuttle service, primitive camping, private parties, shelter rental. 9-hole golf course with separate tees and fairways to make 18 holes. Clubhouse facilities. Located approximately 4 miles northwest of Waverly; call for exact directions.